Learn How To Choose The Color For Your Window Blinds! Old windows, new windows, large windows, small windows, bay windows… windows of any kind can be altered, dressed up, made more energy-efficient, and made more functional with the right window treatments. Window blinds are just one of the options when it comes to window treatments and these days, they come in a multitude of colors and styles. Gone are the days of the old metal slats that, once they bent, were bent forever. Blinds today are sleeker, more durable, stylish, and definitely more colorful. Frequently, window blinds are thought of as window coverings that incorporate vertical slats which are raised and lowered with a string. There are also vertical blinds that each rotate individually on spindles to let in more or less light, but can also be closed or opened with a string or chain. The individual slats on horizontal blinds can all be connected with a cloth membrane, making them opaque, but those are technically classified as shades. 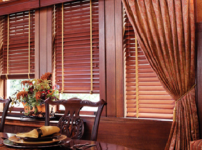 Window blinds these days come in a multitude of materials: plastic, real wood, faux wood, fabric, aluminum, and vinyl. Yes indeed, they have come a long way since their original inception in the 1760s. 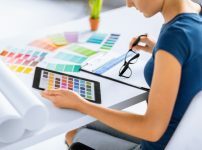 Typically, with all of the sizes, styles, and colors available, window blinds can be used just about anywhere there is a window, with rare exception. But how does one choose the right color? It could have everything to do with the color scheme or decor in the room in question. You may want to match the coloring with your furniture. Then again, if you’re going for a consistent flow, you may want to match the color a little more closely with the wall coloring the carpet. Light colors can make a room look bigger. Light colors and patterns tend to convey a relaxed, more soothing look; whereas, patterns with dark colors are more fun and dramatic. Patterns are also considered to be little modern but be careful not to overdo it. A little bit of pattern goes a long way. There is a popular style of window blinds referred to as blackout blinds, which are extremely beneficial in rooms where blackout conditions are required or desired. Bedrooms, for example, sometimes need to be extremely dark or people can’t sleep well. Conference rooms or other business meeting rooms frequently require blackout conditions for the showing of videos or slides, the use of overhead projectors, and other presentations that need complete darkness in the room. Common, horizontal window blinds can be used in settings that are simply a little less formal in use and decor, rather than excessive window treatments that might be more formal, extravagant, or showy. 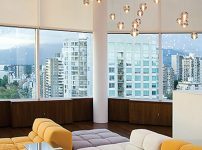 Colored window blinds offer a simplistic yet beautiful and stylish way to dress up a window, let in the light desired, and show off a great view. If you are interested in using them for a new home construction, or you simply want to update your current window treatments, give us a call today!